Trek style: A community lode and home stay. Himalayan scenery : Sisne Himal, Gurja Himal, Dhaulagiri I (8167m), II, III, Tukuche Peak, Nilgiri, Annapurna I (8090m), South Annapurna, Annapurna II, II, IV, Lamjung Himal, Machhapuchhare, and Manaslu I (8163m). 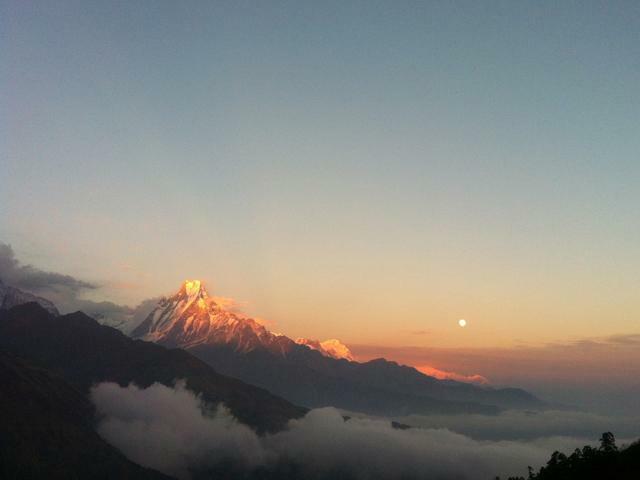 Trek price $832 per person Sunset on Annapurna I and South Annapurna. The ‘Khopra Ridge Trek’ is a newly opened sustainable community lodge based trip in the Annapurna region. It was camping style trek in the past years. 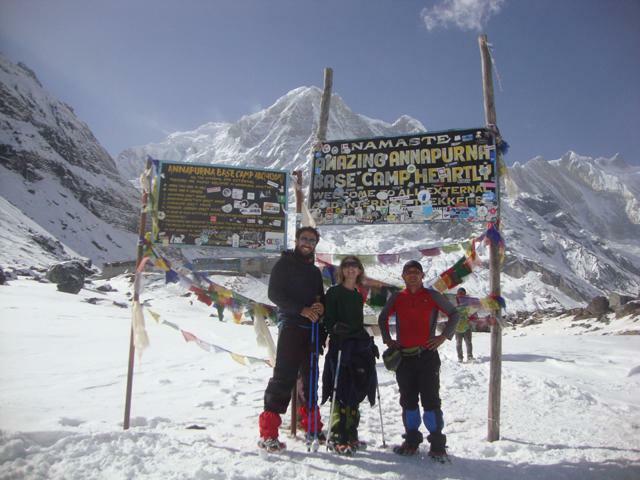 This trek is located away from busy trails of Annapurna and few trekkers know about it. It offers to stay at a teahouse with the best panoramic views of Mt. Dhaulagiri I, II, III, IV, Nilgiri, Bhahra Shikhar, and South Annapurna etc. It is classic trekking in Nepal including pastoral villages, paddy fields, jungles, wildlife, yaks and panoramic Himalayan views. 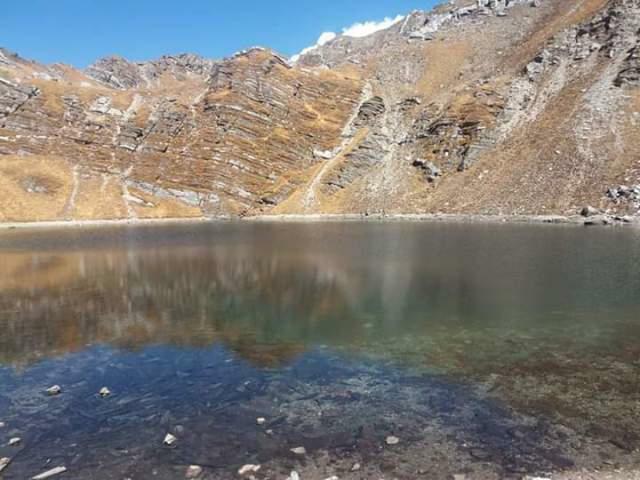 There is Khayer Lake, a sacred Lake at the foot of South Annapurna (7219m) peak. It takes an extra day to hike to the Lake from Khopra Danda at the teahouse. There go shamans for graduation in the full moon of August each year. Khopra joined Mohare Danda Trek begins with taking the flight or bus from Kathmandu to Pokhara. We travel to Beni by bus and trek to Mohare Danda viewpoint in the beginning. 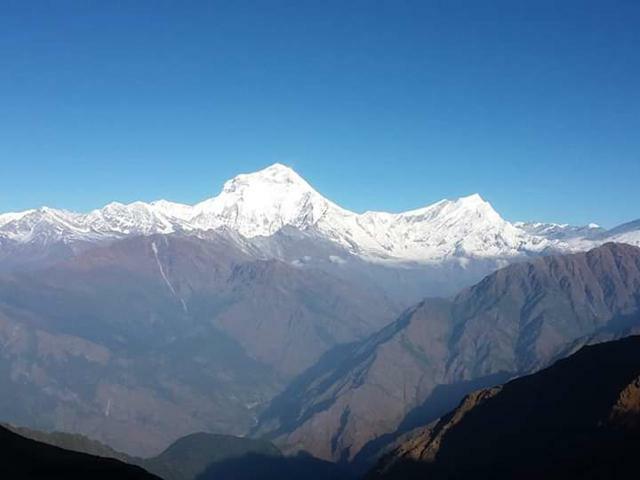 Mohare Danda viewpoint is at 3320m elevation where can see panoramic views of 30 snow-capped peaks including Sisne Himal, Gurja Himal, Dhaulagiri I (8167m), II, III, Tukuche Peak, Nilgiri, Annapurna I (8090m), South Annapurna, Fishtail and Manaslu I (8163m) etc. The visitors can see Sunrise and Sunset from Mohare and can see the tallest hills of Magdi, Parbat, Baglung, Tanahung, Gorkha, Kaski, Gulmi, Palpa, Ardhakhachi, Rukum which are neighboring districts of Magdi. So, there is a 360-degree view that is the main attraction of Mohare to the trekkers who says I have seen unforgettable Himalayan scenery in life. It’s out of the touristic area and lovely birds are singing around you. Mohare Danda attracts to natural lover each season however it is more beautiful when there are blooming colorful Rhododendrons in March/April/May and winter snow covers in January/February. The Khopra Ridge is on the North of Mohare Danda that is walk down the hill in the valley before get up to a ridge of the Khopra. Then, we walk through Rhododendron forest to join on the busy trail of Annapurna at Tatapani. Then, trek to Gandruk village and back to Pokhara by bus. We fly or drive out from Pokhara to Kathmandu at the end of the trek. Day 01: International Airport Picks up. Our company representative shows cardboard of High Camp Trekking at the International Airport and helps you transfer to the Hotel. We explain to you about interesting places to see in Kathmandu. Includes:- Standard single or twin bedroom in Kathmandu. Day 02: Trek briefing and preparation. We brief to you day by day trek schedule and packing list of trekking equipment while on the trek. We obtain hiking passes and bus tickets. We take to you for a tour of world heritage site Sawayambunath (monkey temple) in the afternoon. Includes:- Standard single or twin bedroom with breakfast with tea or coffee in Kathmandu. Day 03: Kathmandu to Pokhara by tourist bus. We go to the Tourist bus station after we had breakfast. The bus leaves to Pokhara from Kathmandu at 7:00 AM. We pass towns, countryside, Trishuli and Marsyandi River valley to reach Pokhara. We see Mt. Ganesh Himal, Manaslu and Annapurna range on clear weather from the Prithvi Rajmarga Highway. We do a tour on Lakeside (tourist area in Pokhara) and boating on the Fewa Lake and visit Tal Baharahi Temple into the center of the Lake after arrival in Pokhara. Includes:- Breakfast, Lunch and Dinner with tea or coffee and standard single or twin bedroom in Lakeside/Pokhara. Day 04: Pokhara to Banskharka 1526m/6hrs via Beni. After having breakfast in Pokhara, we drive to the Beni/Galeshwor trek starting point. We take lunch at River Side Hotel in Galeshwor before we start trek to Banskharka (1526m) for 3hrs. We pass through villages to reach Banskharka. We do a tour in Banskharka which is a beautiful village of the Magar community with an orange farm and it has a long history of mandarins and honey production. We eat dinner and breakfast at community dining and sleep at one of the villager’s house. Includes:- Breakfast, Lunch and Dinner with tea or coffee and normal twin bedroom in Banskharka. Day 05: Banskharka to Nangi village 2320m/4hrs. We are leaving Banskharka after breakfast. It takes 7hrs to get to Nangi village (2320m) from Banskharka. We take lunch at Dandakateri after 3 hrs uphill walk. We pass through beautiful villages with stunning views of Machhapuchhare Peak and Dhaulagiri range from en-route of Nangi village. We stay at Nangi community lodge. We visit the community-based school, fish farming, mushroom farming, Handmade Lokta paper Making project, Women’s clinic and forestry nursery in Nangi village. These are all Community-based projects to generate income for community support and environmental preservation. Includes:- Breakfast, Lunch and Dinner with tea or coffee and normal twin bedroom in Nangi. Day 06: Nangi to Mohre Danda 3320m/5hrs. Leaving Nangi village, we have uphill walk to reach Hampal resting place where you have lunch. Again, we have a gradual uphill and a few straight walks through Rhododendron and oaks forest to reach Mohare Danda (3320m). We stay at Mohare Danda Community lodge which offers a long panoramic range of Dhaulagiri, Annapurna, and Manaslu. We see excellent views of Sunset and Sunrise from Mohare Danda. Includes:- Breakfast, Lunch and Dinner with tea or coffee and normal twin bedroom in Mohare. Day 07: Mohare Danda to Swanta 2214m/7hrs. After having breakfast with Sunrise view at Mohare, we go downhill through Rhododendron forest to reach Dandakharka where we have a tea break at community lodge. We walk straight for a few hours to reach Phalante where we join on the trail of Annapurna Circuit. After lunch at Phalante, we go downhill to the River. From here, we ascend through a paddy field to the Swanta village (2214m) in less than an hour. Includes:- Breakfast, Lunch and Dinner with tea or coffee and normal twin bedroom in Swanta. Day 08: Swanta to Dhankharka 3026m/4hrs. Leaving Swanta village, we ascend through the dense forest of Bamboo and fire birch to reach Dhankharka at elevation 3026m. We arrive here for lunch and spend a night for safe acclimatization. Includes:- Breakfast, Lunch and Dinner with tea or coffee and normal twin bedroom in Dhankharka. Day 09: Swanta to Khopra Danda 3660m/6hrs. We climb 640m through Rhododendrons forest to reach Khopra Danda (3660m). We see yaks are grazing en-route. Khopra Danda is also known as Khopra Ridge where we stay at the large community lodge. After lunch, we go to the viewpoint along the Khopra Ridge to see the deepest Kali Gandaki River valley. 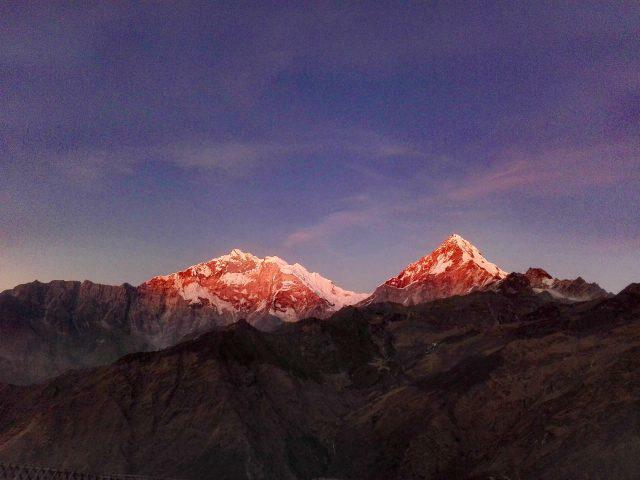 We see the excellent views of Sunset over Dhaulagiri range from Khopra Danda. Includes:- Breakfast, Lunch and Dinner with tea or coffee and normal twin bedroom in Khopra Danda. Day 10: A long day hikes to Khayer Lake 4500m/7-8hrs. Today, we have early breakfast for a long day hikes to Khayer Lake at elevation 4500m. We climb gradually uphill 940m to reach Khayer Lake which is a sacred Lake for Hindu and Buddhist. There go shamans for graduation in the full moon of August each year. We see Annapurna Fang, South Annapurna and Dhaulagiri range from en-route. We descend to Khopra Danda and spend a second night. Day 11: Khopra Danda to Dhobato 3420m/6hrs. Leaving Khopra, we have a narrow and rough trekking trail which takes us downhill through dense Rhododendron forest to reach a wooden bridge before we are ascending to Bayeli. After lunch at Bayeli, we have the next a few hour mixes of ascending and descend walk to reach Dobato (3420m). We might see Monkeys and Pheasant (Nepali National Bird) en-route. Includes:- Breakfast, Lunch and Dinner with tea or coffee and normal twin bedroom in Dhobato. Day 12: Dhobato to Gandruk 1940m/6hrs. We hike up to Muldhai viewpoint (3637m) to see the Sunrise over 33 snowy peaks in the Dhaulagiri, Annapurna, Manaslu, and Ganesh Himal ranges before breakfast. It is the best viewpoint en-route of Khopra Ridge Trek because we can see the world’s 6th, 7th and 10th highest eight-thousander and so many other snowy peaks. We back to the teahouse for breakfast and pack the bag. From here, we walk a mix of ascending and descend through Rhododendrons and bamboo forest to reach Tadapani (2630m). After lunch at Tadapani, we walk downhill through Rhododendrons forest to reach Gandruk village (1940m). Includes:- Breakfast, Lunch and Dinner with tea or coffee and normal twin bedroom in Gandruk. Day 13: Gandruk to Pokhara by bus 3hrs. We have breakfast with views of favorite Machhapuchare Peak. We take a tour to old Gandruk village, Gurung cultural museum and costume center. Then, we walk to the bus station and traveling to Pokhara by bus. Includes:- Breakfast, Lunch and Dinner with tea or coffee and standard twin bedroom in Lakeside/Pokhara. Day 14: Pokhara to Kathmanbu by tourist bus 6hrs. We are going back to Kathmandu by tourist bus which takes about 6 hrs. We take breakfast and lunch on the way. We take to your Hotel from the last bus stop. Includes:- Breakfast and Lunch and tourist bus tickets. Note:- Request for a costum itinearary. 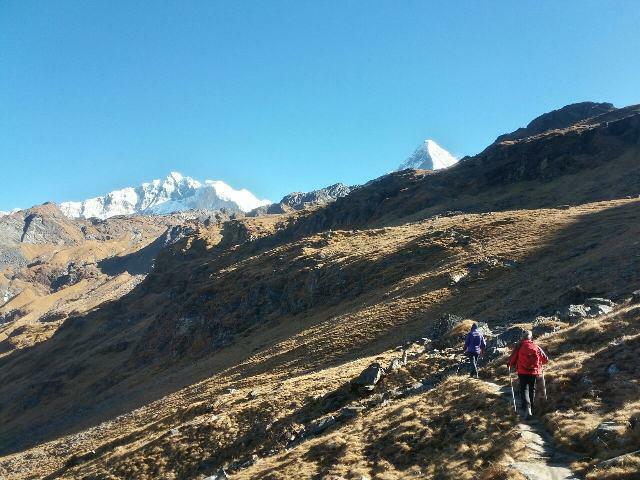 Do you have any questions about Khopra Ridge Trek or Mohare Danda Trek? Or, would you like to see how it can be customized to your needs? Please DM us. The following cost and date are for per person for online booking. If the Khopra Ridge Trek departure dates do not match for you, please DM us and we will happily customize your trip on the date that you need. International Airport picks up and departure. 2 nights accommodation (standard twin bed room with breakfast) at 2** Hotel in Kathmandu. Note:- if you book yourself Airport transfers and accommodation in Kathmandu, we will reduce cost from pacakge. Kathmandu to Pokhara to Kathmandu tourist bus tickets for clients, guide and porter. Pokhara to Beni local bus tickets for clients, guide and porter. Two nights accommodation in Pokhara. Teahouse meals for clients: 12 Breakfasts, 12 Luches and 11 Dinners with tea/coffee etc. Meals can be selected from menu and will have enough daily. Accommodation (normal room) at teahouse while on the trek. Nepali staffs:an experinced guide and necessary porter. Meals and daily salary for guide and porter. Gandruk to Pokhara local bus tickets for clients, guide and porter. Private bathroom during the trekking days. If the clients want private bathroom, there have to pay differences between common and private bathroom. Private jeep/van or horse renting while on the trek. Sightseeing in Kathmandu, Bhaktapur and Patan etc. Note:- Tour guide and transpotration can be arranged on client's request. Please read carefully cost includes and does not include above. All the meals are included with tea/coffee while on the trek. We do not include drinking water or boil water which you can buy at teahouse; this is $1 to 3 per liter. You can take water purified tablets or Seripen for a cheaper solution. Wi-Fi, battery charge and hot showers are not included. Wi-Fi is $1-3. Battery charge is $1 to 5 for the full charge per device (you can take power bank for a cheaper solution). The gas shower is USD2 to 5 per head. We do our best for your safety. Although we suggest you buy comprehensive travel Insurance that can cover flight cancellation, medical treatment, and Helicopter rescue emergency evacuation. Please buy the policy that can cover for trekking activity up to 5000m for the days you will actually be trekking. If you do not like traveling by local bus, we arrange private car/van/jeep on your request that would be an extra cost you have to top on the package. Comfortable hiking boot. Three pairs of socks. Sandals. Sleeping bag (-10 degree centigrade) with hood. A day bag (25 to 35L) or rucksack large enough (60 to 65L) size. 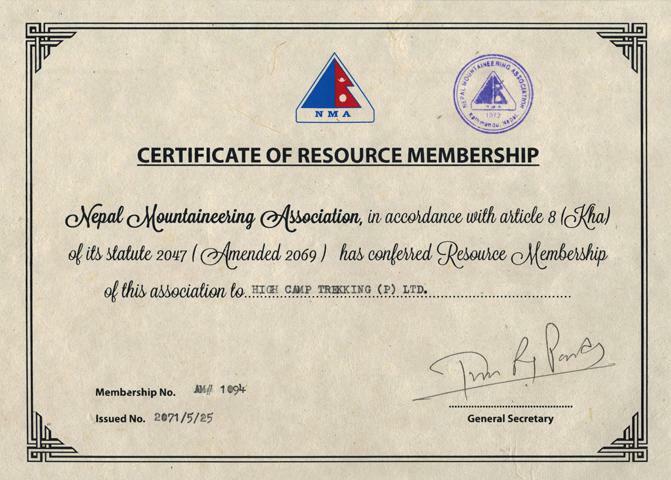 We are registered on the Department of Nepal Tourism and have authority to operate trek and climb in the Himalayas of Nepal. We are the Taxpayer to Nepal Govt. 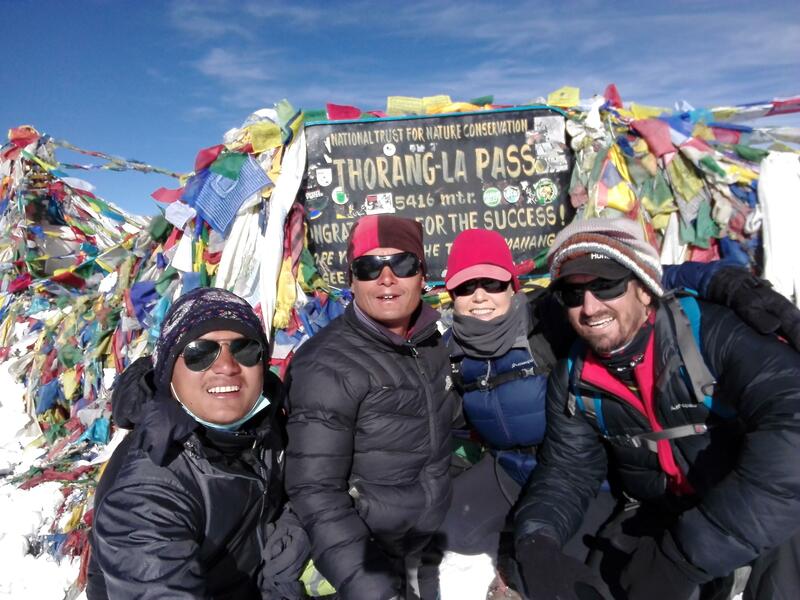 We are healthy and up to date a local trekking agency based in Kathmandu. We respond to every email/inquiry in less than 24 hours. You can call us anytime at +977-9841876395 (24 hours support team). Note:- There are more similar to our name of other agencies. Please remember that we are known as High Camp Trekking.